Oblong was founded in 2006 with the goal of creating the next generation of computing interfaces. We're a company of designers, programmers, and hardware engineers. We're committed to a full stack approach to technology development. We work on the most interesting problem we can think of, which is how to make computers more flexible, capable, useful, interactive, and empowering. Our Chief Scientist, John Underkoffler, designed the computer interfaces in the film Minority Report. Today we sell commercial versions of the Minority Report computers. These are, famously, gestural systems. But they do much more than simply allow users to point and gesture to interact with computers. (And, in fact, gestures themselves are optional.) These are spatial, networked, multi-user, multi-screen, multi-device computing environments. Here's John Underkoffler at TED in 2010 talking about Oblong's motivations and technology. TED Talk from Oblong Industries on Vimeo. 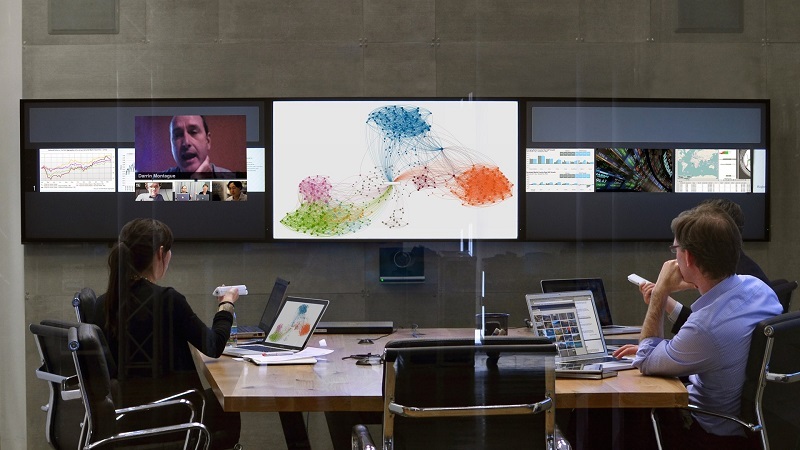 Oblong's technology platform brings data sets, workspaces, and communications channels to life across multiple screens. It allows interaction from any number or type of input devices simultaneously, including touch screens, phones, and tablets. And it frees the user from sitting in one place, tied to one device. The three most important trends in the technology world today are cheaper pixels, evolving device form factors, and increasing amounts of accessible data. Oblong provides a new generation of computing tools -- a new technology platform -- built around these three trends. and multiple devices. Our customers use g-speak to solve big data problems, to collaborate more effectively, and to go from looking at pixels on a single screen to interacting with pixels on *every* screen. We transform computing from a one person, one screen, one device experience into a fully shared and interactive experience. We're the only company that brings together all your screens and all your devices into a multi-user, multi-device, multi-screen unified environment. We're also the only company to combine data presentation and analytics capabilities with collaboration capabilities, enabling you to turn big data into insight and intelligence. Today Oblong has offices in Los Angeles, Barcelona and Boston and demo showrooms in New York, London, Washington DC, and Silicon Valley. We work with Fortune 500 companies, government agencies, and universities. Our customers include Boeing, Saudi Aramco, GE, IBM, and SAP. 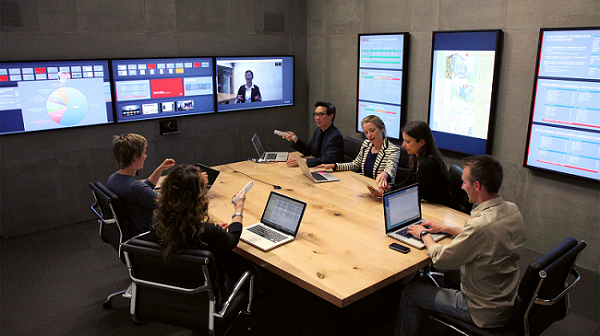 Mezzanine: Next-Generation Meeting and Conference Room Technology from Oblong Industries on Vimeo.